You can enter the WIZnet Connect the Magic 2014 Design Challenge by uploading your Entry via Entry Dropbox. The Entry Deadline is 12:00 PM EST on August 3, 2014. Each project entered in the Challenge must be the original work and sole and exclusive property of the person or team who submits it or the Participant must have written legal permission from the property owner. In the case of Projects owned by other parties, the written legal permission must be included with the Entry. Entries should be submitted in digital format and must be written in English. Entries may be submitted in hard copy format by prior arrangement. For an Entry to be deemed acceptable, the entrant must first submit a completed Project Registration Form. To submit an Entry, the Participant must upload his/her project files via the Entry Dropbox. If a Participant absolutely cannot use this upload process, the Participant can e-mail the Entry to contest@circuitcellar.com or send a CD-ROM, DVD, or USB stick via mail to the address below. Mailed entries must be postmarked no later than 12:00 PM EST on August 3, 2014. Label everything with your Project Registration Number. Read the Official Rules for complete details about eligibility, project requirements, your rights (intellectual property), judging, prizes, and more. Obtain a Project Registration Number by completing the Project Registration Form. Remember: Label your entry with your Project Registration Number. Also, please type your Project Registration Number in the subject line of any e-mail correspondence about the Challenge. 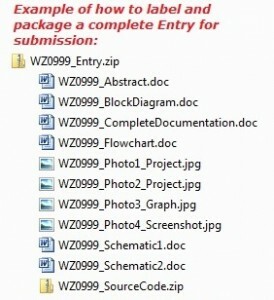 Here is an example of how to label your Entry files. Example of an Entry. Use your Project Registration Number to label all files. Remove your name from all of your Entry files.